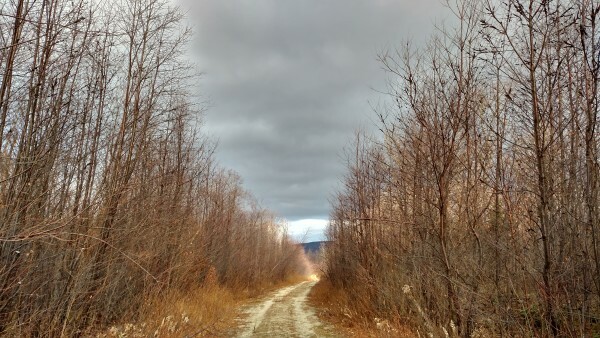 An old logging road in the woods between Barnard Mountain and Baxter State Park. Maine lawmakers like to put out fires. Most would tell you it’s why they ran for office — they want to solve problems in order to help our businesses grow and help our families be healthier and happier. We can all get behind that; it’s exactly what government should be doing. But sometimes policymakers get ahead of themselves and miss the unintended consequences — the embers that are not quite extinguished. With this in mind, Maine’s biomass energy policy should be carefully considered. Producing energy from biomass is a classic example of Yankee ingenuity and thrift. In the process of harvesting timber for paper and wood products, the unusable parts of the tree are chipped up and burned to produce heat or electricity. Biomass eliminates forest waste, supports jobs in production and delivery and offers a sustainable alternative to fossil fuels that brings consumers closer to the energy independence we all seek. If we stopped here in our analysis, there would be absolutely no reason not to forge full steam ahead with policies that support and incentivize the production of biomass energy. In fact, that’s what Maine lawmakers seem to be doing in droves. This winter, Sens. Susan Collins and Angus King introduced and helped pass an amendment to the federal Energy Bill that would define biomass as renewable and carbon-neutral. And the Maine Legislature is considering a bill that would categorize biomass as producing zero greenhouse gas emissions. These seemingly small designations take on far-reaching implications in a federal or state policy statement. In their current use and context, they leave at least one significant unintended consequence still smoldering: air pollution. The question of how biomass is burned is critically important, yet it has not been articulated in either piece of legislation. Renewable energy is not necessarily clean energy; it only takes one night by a smoky campfire to know that to be true. And carbon-neutral fuel is not necessarily healthy if it doesn’t burn clean in real time. A person with asthma is no less likely to experience an asthma attack from an open wood fire just because a new tree eventually will grow and soak up some carbon dioxide along the way. The embers are still simmering in our biomass policies and the unintended consequences include the serious impacts on our health and health costs. If biomass energy is to be produced, parameters must be set for how it is burned. Maine lawmakers must craft biomass policies that include use of the best available technology to control pollution from what is widely accepted to be a very inefficient fuel source. The dangers from unhealthy air are simply too great: decreased lung function, aggravated asthma, heart attacks and even premature death. Children, seniors and people with heart and lung conditions are particularly at risk when air quality is ignored. The University of Maine is internationally recognized for its cutting-edge development of energy technology and for its innovative design of plant-based plastics, chemicals and composite building materials. Our state and federal biomass policies also should invest in research and development of better pollution control technology, which Maine could export to other states and nations, as well as alternative uses for wood waste that support our hardworking loggers, truckers and sawmills. Maine’s geography and local pollution sources can put even our smallest communities at risk for unhealthy air. That’s why the use of strong pollution controls must be paired with a robust expansion of Maine’s air quality monitoring network and wood smoke studies in urban and rural areas. If biomass is going to be used to produce heat and electricity, it should be done the smart way and the healthy way. The recently installed system at the University of Maine at Farmington is an encouraging example of safer, more efficient technology. This model of using the best available technology to maximize energy output while minimizing air pollution must be followed everywhere biomass is used for energy production, and it must be reflected in our state and federal policies. Until now, only part of the biomass story has been told and only part of the solution has been considered. But our impact analysis also must consider air pollution, carbon emissions and the health of our children. When we craft our biomass policies, let’s make sure we put out the fire that leads to asthma attacks, chronic lung conditions, cancer and early death. John Chandler is a former scientist and engineer at the Maine Bureau of Air Quality and a member of the leadership board of the American Lung Association in Maine.